Brahmi (Bacopa) is one of the most reputed medicines in Ayurveda. Brahmi is a wonderful tonic for the nervous system. This is the main tool for stimulating and strengthening nerve and brain cells. 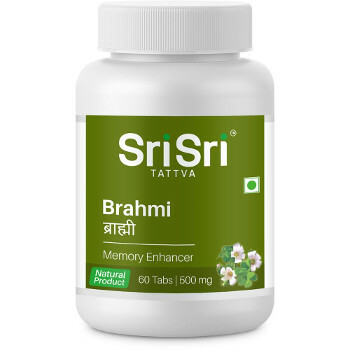 Brahmi enhances memory used to treat mental disorders, epilepsy, improves concentration, improves hearing, regulates blood pressure. Acts as a sedative, reduces anxiety children. Indications: tonic for the nervous system, nervous disorders, large mental stress, loss of memory, hearing, depression, cramps of nervous origin, epilepsy. Content: Bakopa monnieri powder 300 mg, Bakopa monnieri extract 200 mg. Dosage: adults: 1-2 tablets twice a day before meal; children 6-14 years: 1 tablet before going to sleep. Contraindications: people with weak heart rhythm (bradycardia) is better not to use Brahmi. Pregnancy and lactation: can be used in small doses. Original name: Brahmi Sri Sri Ayurveda. In our store You can buy authentic Brahmi Sri Sri Ayurveda at a bargain price! In Ayurveda, there is another plant of the same name and almost identical properties. This is Gotu Kola, Mandukparni or Canella asiatica. Somewhere You even can read that it is the same thing. In fact, it is not so. Both medicines effective for the treatment of disorders of the nervous system, but Mandukaparni has a much bigger range of uses.